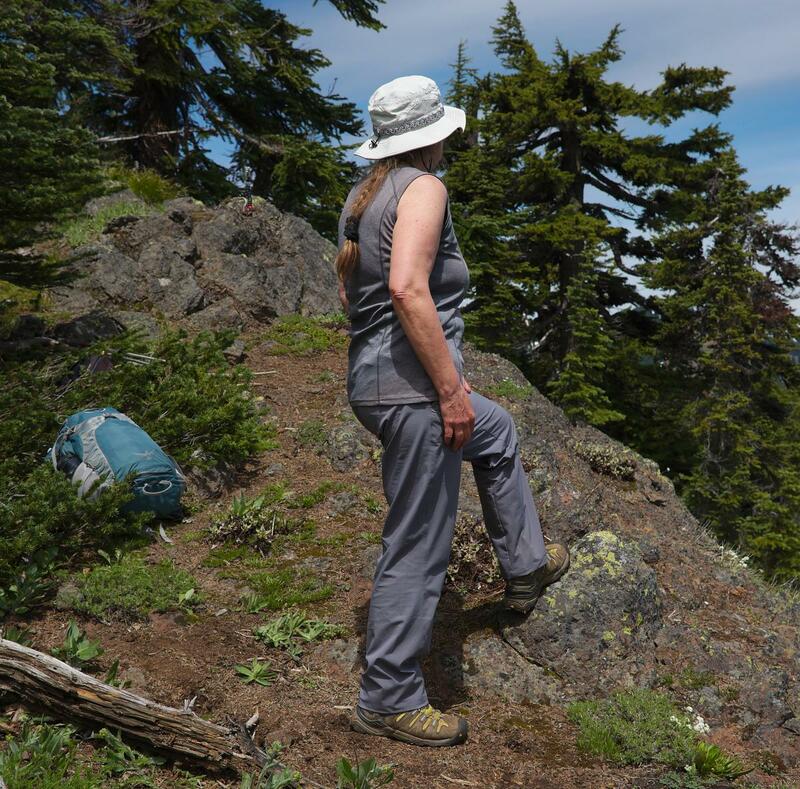 This hiking pants review features a pair of women's hike pants from My Trail Company. Could these be the best hiking pants for you? There are some unique aspects to these pants, reflective of the gear company that makes them. to use the very best outdoor stuff myself on hikes and backpacking trips. So rest assured that I will not recommend something that I don't believe will perform well on the trail. And in every review, I do a thorough job of pointing out the merits and drawbacks of something as basic and necessary as a pair of hiking pants. 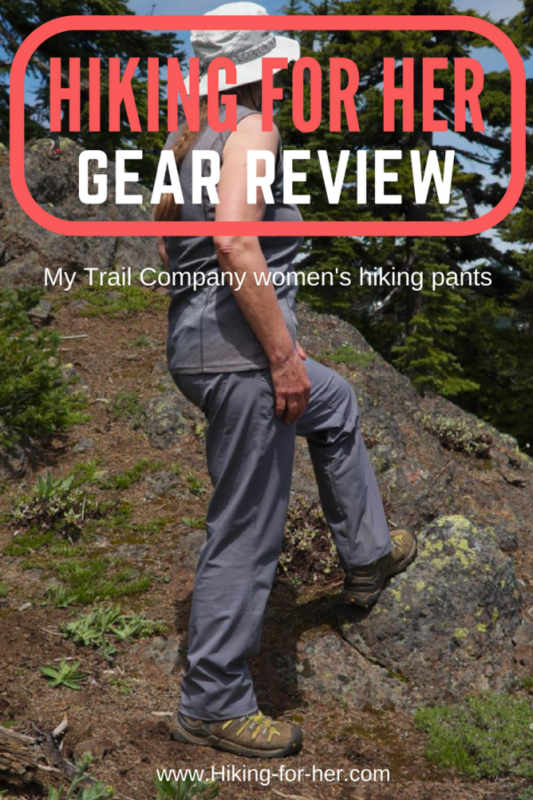 My Trail Company sent Hiking For Her this pair of women's hike pants to receive a thorough and honest review of this hiking apparel. 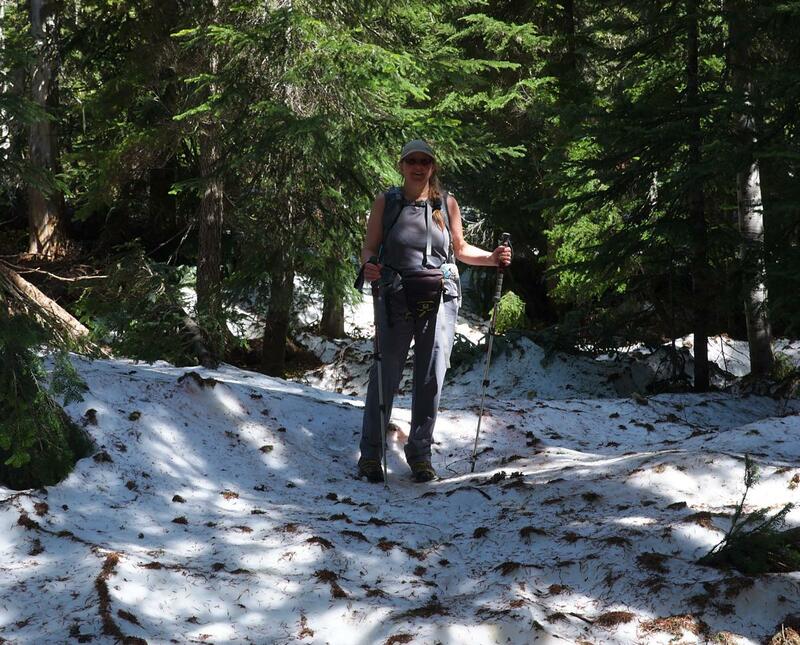 All of the opinions, comments and photos in this hiking pants review belong to Hiking For Her. If you purchase a pair of My Trail Company pants using this link, Hiking For Her receives a small percentage of your purchase price without increasing your price at all. My Trail products are sold directly to customers, either on line or in their Boulder, Colorado USA store. Let's jump into why this company knows its way around hiking gear! And whether these are the best hiking pants for you! Any memories of GoLite gear? One of my all time favorite backpacks for long trips is a GoLite Odyssey. Although I purchased it many years ago, I still use it. I can't recommend one to you, though, because the GoLite company is no more. But wait! You can still tap into the brain trust of this ultralight former company using My Trail Company gear and clothing. It was started in 2015 by GoLite's founder Demetri Coupounas. GoLite product designs are being used as the foundation for improved versions, currently sold as My Trail Co products. 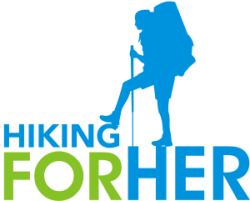 That's why I was more than willing to try out a pair of their women's hiking pants and post my results here for all women hikers to read. Before reporting my field results, here are some technical details as well as a description of the conditions these pants were exposed to. Let's be blatantly obvious here, in case you're searching for your first ever pair of trail pants. To say these pants feel feather light on your body seems trite, but geez, it's true! Even better, these pants can be rolled up tightly and crammed into a backpack (which I did, just for you, dear reader) and will arrive at your destination looking good once you pull them on. More info regarding durability, comfort, water repellency, fit and fashion coming right up in this hiking pants review! In order to do a thorough hiking pants review, I wore them in two very different conditions. The first outing was during a flat but double digit training hike in sunny weather, followed by a meal in a restaurant (to test the ability of the pants to look good off trail, of course). The next hike was steep (+3500 feet elevation gain), long (8+ hours with over 13 miles of trail) and had several off trail miles. The upper reaches of the trail were buried in snow, so lots of clambering over logs and roots, plus the endless entertainment of post holing, ensured that I gave these pants a good work out. At the end of the day, I was covered in pine needles and sweat, and the pants had plenty of mud on the hemline as well as the seat. This hike was also a great test of the nylon's water repellency and abrasion resistance. In order to describe the fit in this hiking pants review, let me disclose that I prefer my hiking clothing to be a bit on the loose side. I tend to stray off trails to explore back country destinations, and that means I'm bush whacking, scrambling over talus, slip sliding through wet vegetation... just like the hike I described above. So I can't encase my hips, knees and leg muscles in tight pants legs. Even if you stick to the trail day in and day out, there will be times when you have to navigate around tree blow downs, wash outs, or tricky footing. Hiking For Her's philosophy about women's hiking pants: It pays to pay for freedom of movement! These My Trail Company hiking pants provide a relaxed fit, perfect for a hiker like me. The biased waist ensures more flexibility, or "give" to the fabric. The zipper is quite short, because these pants sit below the waist. The zipper has a metal snap fastener at the top, bearing the My Trail Co logo. A shorter zipper, plus a lower waistband, means there isn't a lot of fabric binding your waist and fighting with your pack's hip belt or your camera case waist belt. In order to get a secure fit, I threaded my favorite adjustable lightweight fabric belt through the soft fabric belt loops. I loved that the pants did NOT come with a belt. Why drive up the cost with a belt that might not be what I want or need? You might not need a belt, if you order a size with a trimmer fit. Remember, I purposely ordered up a size so I would have plenty of room. Along with some breathing room in the waist and legs, I look for a gusseted crotch in my hiking pants and shorts. In case you've never pondered the merits of a gusseted crotch, please allow me to take you on a brief tour. A crotch earns the title "gusseted" when it has an additional piece of fabric inserted into it to prevent the four seams from the two legs, the front and back pieces of fabric from joining. If you recall your geometry, you'll visualize a rhomboidal shape. It can also be triangular. The gusset is invaluable for a hiker because it doesn't stress the pant seams but it does allow a generous amount of freedom of movement. Ever crouched down in a tight fitting pair of pants and hoped you wouldn't blow out the seams? You were secretly hoping for the extra room provided by a gusset! During a backpacking trip, this little piece of fabric also reduces the likelihood of chafing during warm or wet weather, because there isn't one giant seam in the crotch area. straddling downed logs on the trail. So A+ to My Trail Company for seams that don't chafe, plus lots of room to make specific trail movements without undue pressure on your body. Tip: If you volunteer on a trail maintenance crew, these pants will give you flexibility, abrasion resistance, sun protection, and a full range of movement as you swing your pulaski. To qualify for high marks in a Hiking For Her hiking pants review, hiking clothing needs to stand up to a fair amount of trail insults. and the occasional unexpected event such as post holing through soft snow or tripping over boot laces. Water rolled right off these nylon pants, without pooling or creating wet spots. I sat on wet vegetation during a rest break, and the pants dried quickly once I got moving again. Mosquitoes (and there were plenty) weren't able to pierce the nylon/spandex material. The fabric had no snags or abrasion marks after 25+ miles of trail abuse, which bodes well for a long life span. And they came out of the washing machine looking like new. Tip: Don't put your technical hiking clothing in the dryer. Line drying (or tossed over the shower curtain bar) will extend their lifespan. Some nylon hiking pants are a swish-a-thon, meaning you can definitely hear yourself coming down the trail. These were quiet! Every gear review should also call out the features that might give you pause. This hiking pants review is no different. And who knows? What I consider a drawback, you might gladly embrace or be searching for! Please forgive me for learning to backpack in the dark era of non-availability of women's hiking clothing (the 1970's). I'm not kidding. Nothing. Nada. Zip. So when cargo type pants came along in sizes a woman could use, I was an early adopter. And I fell in love with the plethora of pockets. I still love wearing zip off hiking pants (I know, how uncool am I!!) partly because they offer so many pockets. These My Trail Co pants? One with a concealed zipper on the back, right side. In my pocket loving opinion, the two waist pockets are too shallow and unsecured to do much of anything for me on the trail. And I only used the back pocket for my I.D. and credit card when I went into the restaurant after my first test hike. On the trail, anything stored there would interfere with the fit of my backpack. But to be fair, it was nice to have no weight pressing on my lower thighs, as I do when I store lip balm, snacks, bandanna, face wipes and more in my pocket rich hiking pants. And the pants look very nice without a lot of pockets, so if you're going for streamlined good looks, these pants are worth a look. At the time of this writing in 2017, there are no options for more than one inseam length per size of these pants. However, the company has future plans to make these pants available in several lengths, to broaden their appeal to hiking women. At 5'3" I found the 31 inch inseam to be manageable when my hiking boots were on. In my sports sandals once I was off the trail, they were a tad on the long side but didn't impede my movements to any huge degree. But in all sincerity, I can say these pants have earned a permanent place in my gear locker. For $59 (buy direct; free shipping above a certain price point), you can have freedom of movement in these well constructed, lightweight, durable, water repellent pants. Any one of these features would be worth your time and money. These pants combine all of them! And you won't find a better price at any other brand for this level of quality. You can extend these pants into cooler hiking months by wearing a very thin pair of tights underneath them. Choose a slippery fabric so they won't impede your moveability as they slide against the pants material. And because they are thin and light weight, I plan to wear these pants under my waterproof rain pants when I want more warmth for snowshoeing. As we were navigating through the snow, using GPS to stay on the trail, look what we found! 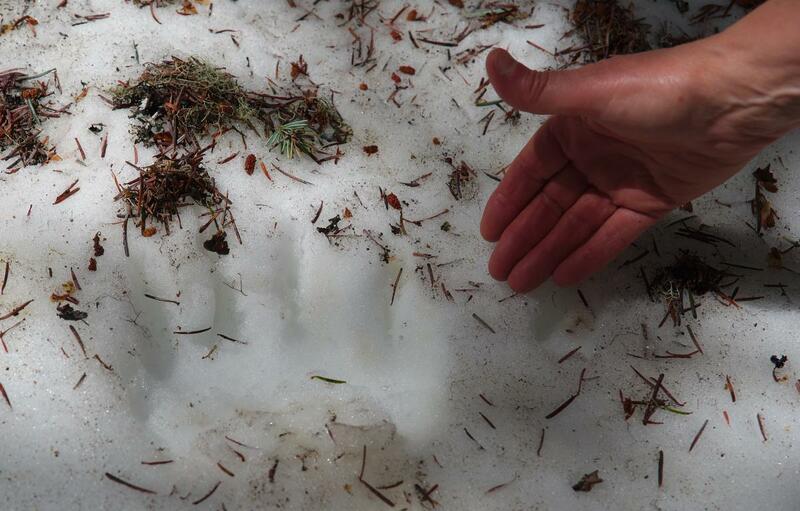 Good thing we didn't literally run into this bear. S/he was headed the direction we had just come from, and these tracks were really fresh. Send them here, and unless I'm away from the computer putting these pants through another round of trail testing, I'll answer within a day or so. After all, the entire point of this website is to get the best hiking gear into your hands and on your body, so you can tackle any trail with confidence and grace. You can also take a closer look right now at these hiking pants here. Or their newest offering: these comfy, durable hiking shorts!